Arts Arlington Blue Jean Ball! Home > News > Blue Jean Ball! 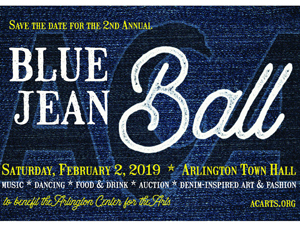 Arlington’s favorite winter arts party is back… the Arlington Center for the Arts (ACA) invites you to the second annual Blue Jean Ball on Saturday, February 2, 2019, so put on your favorite pair of blue jeans and come celebrate with ACA! A fun & festive, denim-draped, one-night-only extravaganze, the Blue Jean Ball (taking place at Arlington Town Hall from 7:00-10:30pm) will feature great music & dancing, food and drink, denim-inspired art and fashion and an irresistible array of “artful” silent auction items, including dance & theater tickets, lakeside getaways, and original artwork, plus this year’s “BIG RAFFLE” – tickets to see The Rolling Stones live in concert! Swing Cafe will get the party started with their unique blend of acoustic swing, jazz, and rockabilly. Later, Shikiboo & Butane Blue Band will have you up on your feet and out on the dance floor with an irresistible mix of upbeat and nostalgic R&B, Mowtown, Soul, and good old-fashioned Rock and Roll. No partner? No problem! We’ll all dance the night away together! You will also have the opportunity to bid on an enticing array of artsy silent auction items, including original artwork and accessories; music, theater, dance, and museum tickets; and some fabulous one-of-a-kind experiences, including a night at the theater with arts & entertainment reporter Joyce Kulhawik; a trip to the Boston Flower Market with Derby Farms owner Barbara Popolow; a one-on-one photo critique with ACA’s beloved photography teacher Emily Belz, and a personal bike lesson with Ciclismo Classico founder Lauren Hefferon!! There’s also a New Hampshire Cottage getaway, and an overnight at the Westin Copley Plaza. Bidding is now open online!! Visit www.acarts.org for listings and details. What to wear? ACA suggests keeping it festive/casual, blue jean/denim-inspired… add your own touch of bling – or simply come as you are! All proceeds support the Arlington Center for the Arts community arts programs. ACA has recently re-opened in a brand-new location at 20 Academy Street in Arlington Center, after a $1million renovation of the top two floors of Arlington’s historic Central School. More info: www.acarts.org.